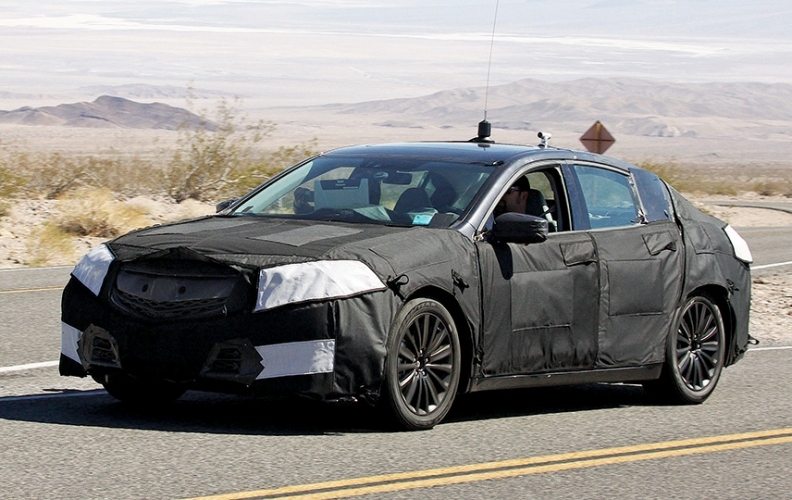 The TLX sedan will replace the TL, which is based on the pre-2013 Honda Accord platform. LOS ANGELES -- Spy photos show that Acura plans big changes for its top-selling TL sedan when it is redesigned and renamed next summer. The TLX sedan will replace the TL, which is based on the pre-2013 Honda Accord platform. The TLX will share the redesigned 2013 Accord's underpinnings. Because the new Accord has a shorter length and wheelbase, the TLX will be smaller as well. It will slot in between the current TL and TSX compact sedans. The heavily camouflaged car photographed during recent hot-weather testing shows a long, sweeping roofline reaching a stubby but more-defined trunk lid than the slippery one on the TL. The nose of the car still comes to Acura's trademark point, although the "beak" grille appears to have been mellowed somewhat. The aged TSX is based on the outgoing Europe-market Accord, which will not be redesigned because the new Accord platform will be used in all markets. That likely will spell the end of the TSX in the lineup, leaving Acura with the compact ILX, mid-sized TLX and flagship RLX sedans. The big change under the hood will be the use of Honda's Earth Dreams 3.5-liter V-6, which makes 310 hp when installed in the RLX. The current TL has a choice of a 280-hp 3.5-liter V-6 or a 305-hp 3.7-liter V-6 when paired with all-wheel drive. The redesigned TLX should also be available with awd, as well as the optional Precision All-Wheel Steering system that debuted with the RLX sedan. During the mid-2000s, Acura routinely sold more than 70,000 TLs a year. Those numbers have fallen sharply since the recession. Acura sold 33,572 TLs in 2012. In this sell-down year, TL sales are off 20 percent through July.